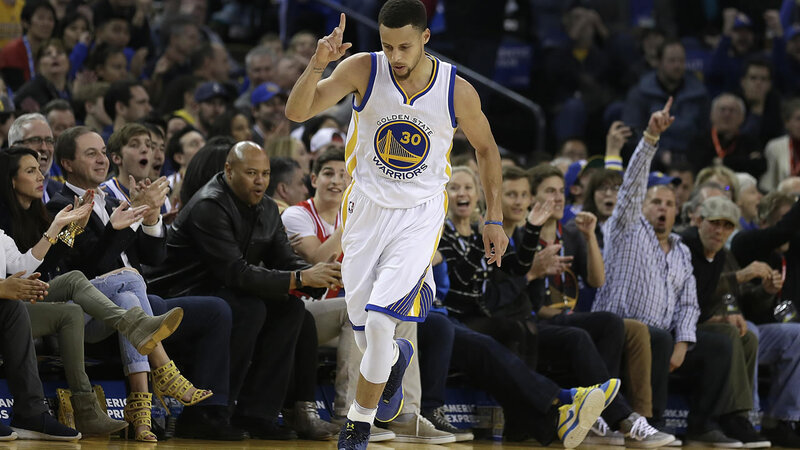 Golden State Warriors' Stephen Curry celebrates a score against the Portland Trail Blazers during the first half of a basketball game Friday, March 11, 2016, in Oakland, Calif.
OAKLAND, Calif. (KGO) -- Stephen Curry scored 34 points, Klay Thompson had 37 and the Golden State Warriors avenged their worst defeat of the season by beating the Portland Trail Blazers 128-112 on Friday night, extending their record regular-season home winning streak to 47 games. The Splash Brothers combined to shoot 15 for 25 on 3-pointers and went 26 for 55 overall, with Thompson joining Curry as the only players with 200 3s in four straight seasons. They scored 30 or more points in the same game for the sixth time in their careers.